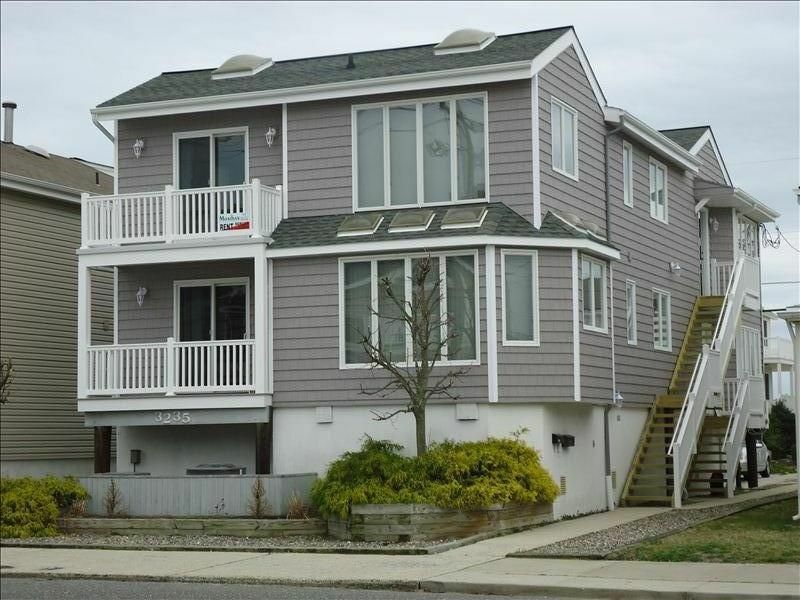 Our house is located on the 32nd block of Central Ave., Ocean City, NJ. We are only one house back from the beach. It is a short 50-yard walk to the beach entrance with no main streets to cross. We recently remodeled the exterior with new siding, stairs, railings and decks. We also installed new kitchens with granite counter tops, and remodeled the bathrooms. Unit size is about 1500 sq ft., with four bedrooms and 2 baths. The master suite has a king size bed and a private master bath. For your comfort and convenience we also have central air, washer/dryer, wireless Internet and 3 TV’s (40” LCD in living room, 32' LCD in master bedroom and 32' LCD in the queen bedroom) and DVD's. Also included is a fully stocked kitchen, off street parking, and outside showers and storage. We also start each year providing 4 beach tags for your use. Family rentals only please. No smoking or pets. Call for after season, holiday and weekends rates. Internet and full cable TV may not be available for off season rentals. Copy of driver's license required for identification verification. I would like to talk to you about my beach house. Please contact me if you have any questions. As a child, our family would vacation at Ocean City one week each summer. In 1999, my wife and I decided to come back to OC with our own family of 3 young children. We fell in love with OC all over again. We spent a rainy day during our week looking at houses, and bought this house a couple months later. We wanted to be close to the beach and this house fit our budget. The house needed some work, and the first winter after we bought it, I repainted the entire interior, installed new carpet and replaced the furniture and appliances. Each year we would make some improvements, and in 2011 and 2012, we had the entire exterior of the house redone and in 2012 new kitchens with granite counter tops. In 2019, we finished the remodeling by redoing the bathrooms. Only 50 yards to the beach and no main streets to cross!! Well arranged space, great kitchen, close to beach, friendly and helpful owner. Space worked well for 3 adults and 4 children. We would definitely return. Thanks for choosing our house for your vacation and thanks for taking such good care of it during your stay. It was a pleasure working with you. I hope to see you again..
great location.. only steps to the beach..
We had a fantastic time staying here. The house is located within walking distance of just about everything a family with young children would want to do. Two blocks from the park, the beach access is about 100' from your back door and OC staples like uncle bills pancake house are all short walks away. We only started our car to go to the boardwalk and if my daughter was old enough to ride a bike we would have left the car keys in the house all week. The house is very open with large bedrooms and lots of sunlight. we stayed in the second floor and had a beautiful view of the ocean from the back balcony. Normally with rentals you wind up having to "make due" with whatever kitchen area you have but that is not the case here. I'll be using this one as a reference for when I remodel my own kitchen. The godshall's were very friendly and responsive from day one. Thank you for making our vacation so great! Very nice condo with great location near the beach, just a half block away. Jerry and Laura delights to work with and anyone would enjoy their time here. We recommend this condo. My family and I enjoyed our stay at the Godshall's property. It is very convenient to the beach and away from the hustle of the boardwalk if you prefer. We have four children and love the boardwalk, but it is nice to have that separation. We were happy to find a property available for the Memorial Day weekend as we decided to make this trip somewhat last minute. We would consider staying at this property again in the future. Thanks again.